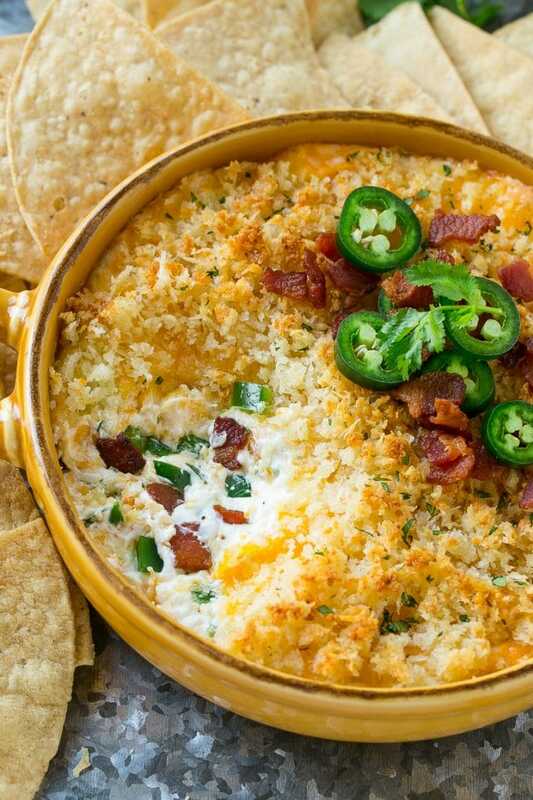 This jalapeno popper dip recipe is creamy, cheesy, spicy, loaded with bacon and totally addicting! It’s made with a blend of cream cheese, cheddar cheese, fresh jalapenos and bacon, then topped with crunchy breadcrumbs. Serve your popper dip with tortilla chips for the ultimate party snack. I love a cheesy hot dip, especially when I’m entertaining. I often serve pizza dip, Philly cheesesteak dip and this amazingly delicious jalapeno popper dip to my guests at gatherings. Jalapeno poppers are one of my biggest weaknesses, when I see them I just can’t say no! This jalapeno popper dip might be even better than the poppers you find in the freezer section, because I took them same flavors and added BACON to the mix. Can you ever really go wrong with bacon? I think not! 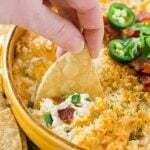 How do you make jalapeno popper dip? 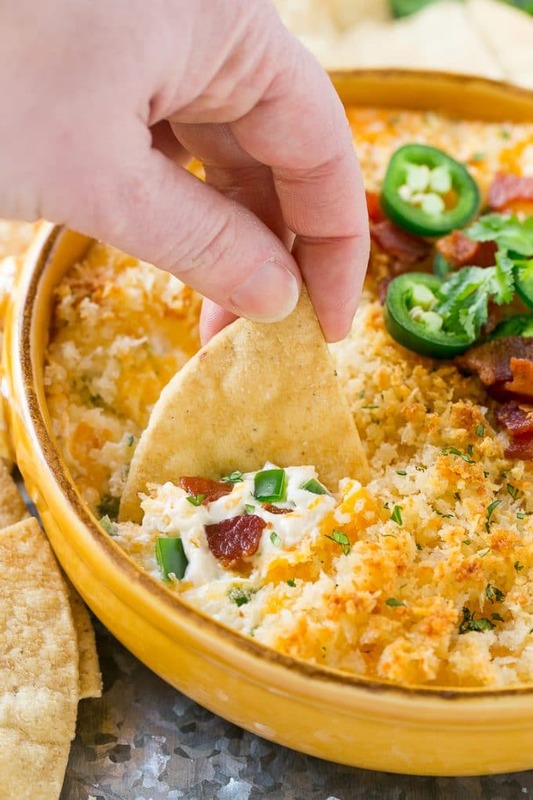 So let’s talk about how to make jalapeno popper dip. 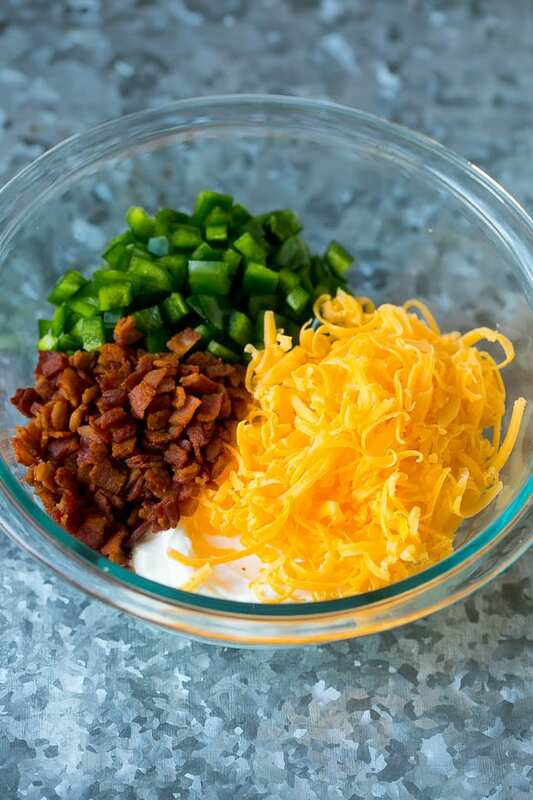 Mix together cream cheese, mayonnaise or sour cream, jalapenos, bacon and cheddar cheese. Place the cream cheese mixture in a dish and top with parmesan and breadcrumbs. Bake until golden brown, then enjoy! After the jalapeno popper dip comes out of the oven, I garnish with chopped cilantro, sliced jalapenos and bacon. 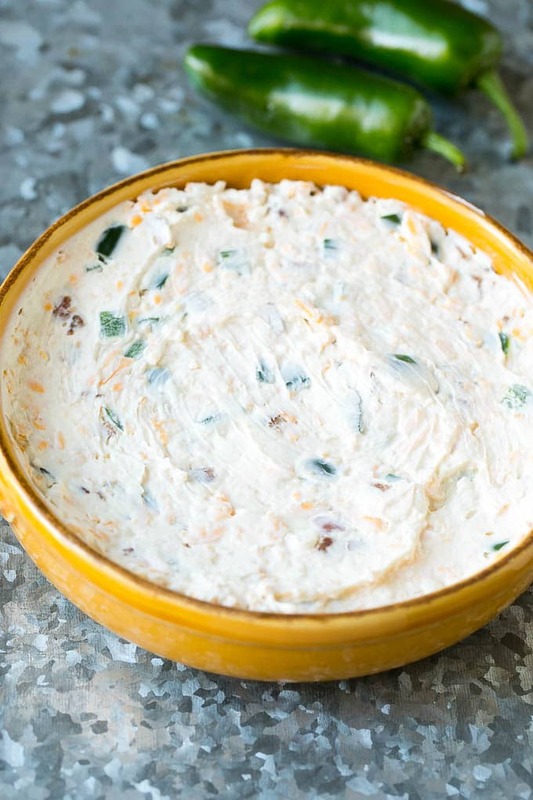 You can make this jalapeno popper dip with either mayonnaise or sour cream. I actually prefer the flavor of the sour cream but I’ve tried it both ways and it’s delicious regardless. I chose to use fresh jalapenos in this recipe where many other popper dip recipes call for canned. I just like the freshness and crunch that the raw peppers add. If you prefer to use canned or pickled jalapenos, feel free to do so. I always remove the seeds from the jalapenos, they hold a lot of the heat but I don’t like the texture of them in the dip. The ribs in the jalapenos also are spicy, so if you like heat keep them in, if you prefer mild remove the ribs and proceed with the recipe as directed. This recipe calls for panko breadcrumbs, which are a type of flaky breadcrumb that can be found in the Asian food aisle. Panko breadcrumbs bake up crispier than traditional breadcrumbs. I like to serve an assortment of dippers to make sure that there’s something for everyone! 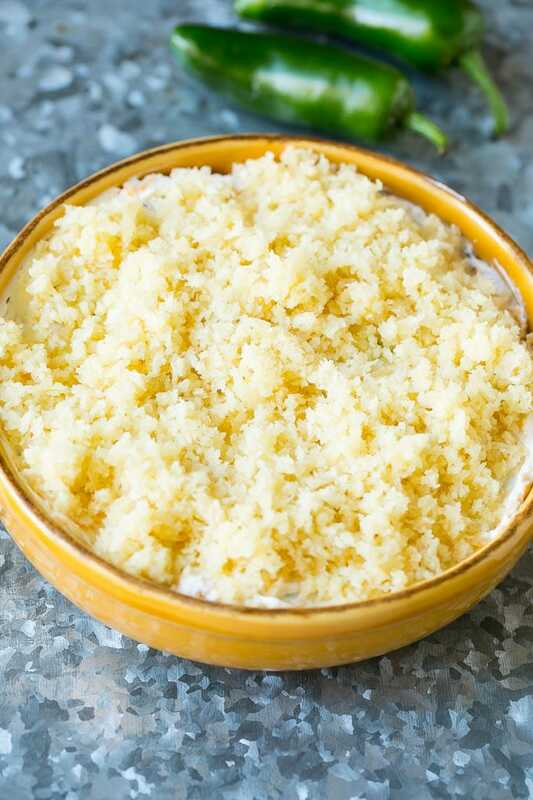 If I’m making this dip for a special occasion, I often prepare the cream cheese mixture in advance, then add the topping right before I’m ready to bake it. No one will be able to resist this incredible dip, be sure to double the recipe for a crowd because there will be no leftovers! 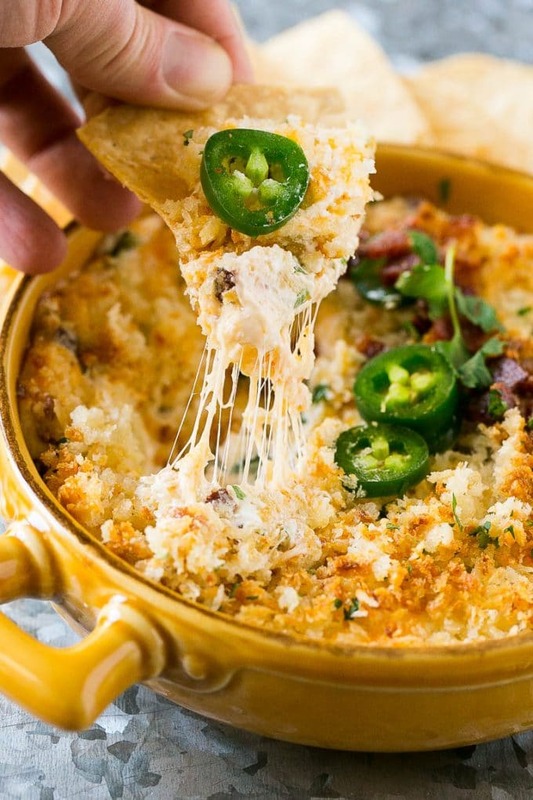 This recipe for jalapeno popper dip is creamy, cheesy, spicy and loaded with bacon! Serve with tortilla chips for the perfect easy appetizer. 1/2 cup mayonnaise or sour cream I'm more of a sour cream fan! Place the cream cheese and mayonnaise or sour cream in a large bowl. Beat with a mixer until smooth. Add in the cheddar cheese, bacon and jalapenos. Beat with a mixer until thoroughly combined, about 1 minute. Coat a small baking dish with cooking spray. The baking dish should have a capacity of at least 3 cups. Spoon the cream cheese mixture into the baking dish, smooth the top with a spoon. In a small bowl mix together the panko breadcrumbs, parmesan cheese and butter until thoroughly combined. Sprinkle the panko mixture on top of the dip. Bake for 10-15 minutes or until top is golden brown. Garnish with bacon, sliced jalapenos and chopped cilantro if desired, and serve immediately. I made this dip and everyone loved it! A real crowd pleaser! I’ve got the Oscars red carpet on and eating this yummy dip! Life as it should be! Great dip for game watching! I’m a fan of the baked cheese toppings!